Nautilus R614 is the previous version of the R616 bike. Although this bike comes with fewer features, this bike is most suitable for people who are looking for an affordable alternative to the next version R616 without any compromise in quality. The R614 won't come with fancy features like that of R616, but still, comes with great features that are worth looking at. In this review, let me explain to you how this bike is built, durability, and also the features it comes with. I’ll also let you help decide whether to go for this bike or not. I'll also describe the downsides of the bike, and let you know if this bike is not for you. The frame of this bike is designed of steel giving you great stability and also adds to the longevity of the bike. The bike also comes with two disk levelers which makes sure that the bike remains sturdy and prevents rocking while riding this bike on uneven surfaces. This is the greatest advantage of this bike. No matter how hard you pedal, the bike won’t wobble and is super-sturdy. The frame has a warranty of 10 years, and mechanical parts and electrical parts have 2 years and 1 years of warranty respectively. The front stabilizer also comes with transport wheels that make the transportation of the bike easier. The flywheel is heavy and also due to the high-inertia drive system, the drive will be smooth. Unlike the user manuals of the bikes that come in this range, the user manuals produced by Nautilus is always of lucid explanation. Most of the frame parts already come pre assembled so that you need not worry about it. You can easily go through the assembly process, but connecting the console to the handles may take some time for some people although it’s easy. The assembling process won’t take more than 30 minutes, provided you have the tools beforehand. The seat is mounted on a rail. Rather than adjusting the seat height vertically, you can adjust the position of the seat on the horizontal rail that increases in height as you go farther from the console. At the farthest position of the seat from the console it supports people of height 6ft 4ins, and when the seat is closest to the console, the person needs to be at least 4ft 11ins. You can easily adjust the position of the seat on the rail by unlocking the lever, moving the seat back or forth, and locking the lever back. A lever system is a hassle-free approach when compared to knob system. There are 20 levels of resistance you can choose right from the console. The resistance levels range from the easy-peasy free drive all the way up to a brutal hill climb experience. The resistance system is an Eddy Current Braking, which is potentially quite and smooth resistance system that allows you to work out peacefully without any screeching noise. The resistance is magnetic, and the magnets move closer the flywheel without touching it to increase resistance without any noise. The heavy flywheel this bike comes with allows you to smoothly pedal even in high resistance levels. Seat: The seat and backrest are of vented plastic and not padded. A thick padding may give you a great comfort but may easily absorb sweat. Nevertheless, as the seat is contoured it offers you decent comfort. The backrest and the seat have little holes in it to allow the air circulation and heat to escape during long workout hours. I’m glad that they didn’t add thick padding to it. The angle of the backrest is fixed, you can’t adjust its angle. Nevertheless, most of the users find the angle to be a sweet spot for comfort. Handlebars: This bike comes with two sets of handlebars. The one set below the seat and the other by the console. The handlebar at the front is fixed at the height of the seat so that you can easily read the console and workout. The handlebars below the seat move along the seat on the rails while adjusting. These handlebars are the one you hold while working out, and. they do come with hand sensors for you to track your pulse rate. Pedals: The pedals are of normal size, giving you a solid platform to pedal on. The pedals are textured and do have plastic straps to prevent your feet from slipping while driving this bike. They are sturdy and well built. If you have an extra large foot of above 11, then straps won’t be suitable for you. Noise: As I’ve said earlier as this bike comes with an ECB magnetic braking system, they are quite with no screeching noise. The flywheel is also heavy resulting in a smooth and quiet drive. You can easily drive these on without disturbing others in the house. The console that R614 comes with is identical to higher priced R616 except the LCD screens aren’t backlit like in R616 model. There are two console displays. You can measure 13 metrics of 3 user profiles. There are 22 preset programs for you to keep motivated to work out. The upper LCD shows you the resistance level (1 - 20) you are in and also the intensity of the workout (1 - 10) based on how fast you are pedaling and the resistance. It will also display you the heart rate sensed by the pulse sensors on the handlebars below the seat. It tracking the heart rate as long as you are resting your hands on your handlebars. It will display you what zone of the workout you are in - fat burn, aerobic, and anaerobic. The lower section of the LCD displays you the goal you’ve selected for the workout. It also displays you basic metrics like time, distance, calories and also you can set the goals like total distance to be covered. The lower display has 3 sections that show the speed/distance, RPM, and the heart rate. Below the lower display, there are some buttons for you to control your workout. There are 10 quick jump buttons for you to jump between 1 to 20 resistance levels. Like 1, 3, 5, 7 like two levels at once. There are 4 navigational buttons in the center for selecting between the user profiles and programs. There is also a user button you to select a profile, pause or end a workout program. At the bottom, there’s a button for you to controlling the fan speed and turn on/off the fan. The console comes with USB port on the top. You can backup or upload your workout data to a pen drive. You can then upload the results to your online Nautilus connect or MyFitnessPal accounts user your profile for tracking. Tablet support: Between the two LCDs of the console, a tablet shelf is there that allows you to operate with your tablet or mobile conveniently while working out. You can watch movies, listen to music. However, while using the tablet the primary tablet will be blocked out of vision. USB port: The USB port is available at the top of the console. It allows you to charge your electronic accessories and also allows you to backup the workout data into a pen drive to upload it to your health tracking apps as I told you earlier. Fan: The bike also comes with a 3-speed fan that blows out a gentle breeze. But this may not be effective in hot summers. Speakers: The bike also comes with a media port and a small speaker to listen to music. The speaker volume is great and almost triple the volume of your smartphone speaker. It’s not so loud. Bottle holder: The bike also includes a large bottle holder that allows you to stay hydrated while workout out. 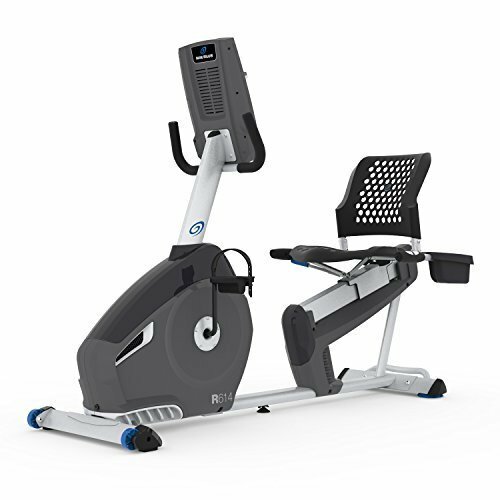 Nautilus R614 is a great recumbent exercise bike. It comes with a variety of features like USB port, charging, console, magnetic resistance, etc. The bike really very silent without screechy sound you get from entry-level recumbent exercise bikes with mechanical resistance and poorly build flywheels. At the price of below $500, the bike is quite affordable for some people.